Wolfgang Amadeus Mozart. Very Good. In very good packaging. 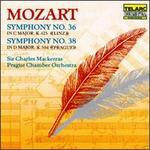 Mozart: Symphonies Nos 36 & 38. Fine. 089408014826 This item is guaranteed to play perfectly with all original artwork and materials. U. Fine. 089408014826 Excellent products Shipped same day from NJ state, We offer good customer service and your orders must be in the USPS truck before 4: 00 PM.